This department consists of an experienced and committed team of staff who endeavour to deepen and broaden our students’ knowledge, skills and understanding of Mathematics. Every student has at least four lessons of Mathematics a week. Students are encouraged to solve problems through a variety of approaches and learn to be confident numerically while being able to apply their understanding into real life situations. In Key Stage 3, students study in line with the New National Curriculum. Students are taught lessons that cover all areas of the curriculum: Number, Algebra, Ratio, Proportion and Rates of Change, Geometry and Measures, Probability and Statistics. The scheme of work enables students to become fluent in Mathematics and develop their Mathematical skills in order to solve problems and reason mathematically. This builds a solid foundation for life and in preparation for studies at Key Stage 4. In Key Stage 4, all students are expected to take the GCSE. 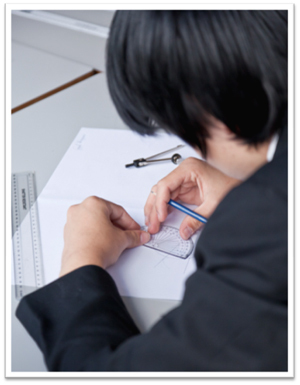 Students will study the Edexcel GCSE Mathematics (9-1), which is offered at two tiers, higher and foundation. Both consist of two calculator and one non-calculator examination at the end of the three year course. For our most successful GCSE students, they have the opportunity to study A Level Mathematics (Edexcel), in Key Stage 5. We gain excellent results at A Level and this is a fantastic launch pad for a range of areas of higher education.